You enter Mutiny Bay shortly after it has been taken over by a marauding band of pirates and Captain Black's voice can be heard booming out at the entrance to the area, giving orders to his crew and pirating advice to young shipmates who pass by. On the very edge of the area you can board a ship of your own and take up watery battle on Battle Galleons, but be warned you will get very wet. Further inland you can venture a ride on a gun-powder barrel as you spin around to the direction of Captain Black on Marauders Mayhem, or board the rocking and spinning Heave Ho. If the wonders of the deep take your fancy then take a journey through the immersive themed SEALIFE aquarium – Sharkbait Reef where you can explore the many fascinating creatures that populate the depths of the ocean. 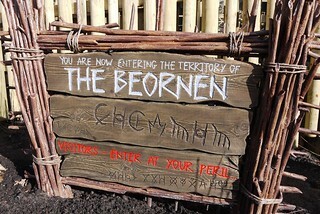 A clearing alongside Mutiny Bay has been claimed as the territory of the Beornen, a mysterious tribe that dwell in the ancient woodlands of the park. The tribe has shunned the trappings of modern life and their territory is filled with rustic torches and wicker sculptures, though none so great as that of Wicker Man, the park's new wooden coaster. The territory spreads down one side of the Mutiny Bay Courtyard, where thirsty travellers can find The Welcom-Inn. For those wanting to prove themselves worthy, there are various Rites of Passage throughout the area as well as the obligatory Wicker Man Shop. 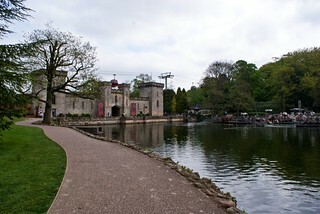 The area on which Mutiny Bay stands today is one of the oldest parts of the theme park, originally the location of a stables and blacksmiths of the estate. When the amusement park first opened the area was first known as the Ingestre Centre and was home to the stations for the Park Railway and Cable car, with an expansion in 1981 to include White Water Flume. In 1984 the area was renamed Aqualand and over the following years expanded to include a whole range of rides including the Octopus, Mississippi Showboat and Crown Carousel before being split with the creation of Kiddies Kingdom and Towers Street in 1986. Also in 1986 the area hosted the Grand Canyon Rapids Ride, Alton Towers' second major water ride. The following season the old Cable Car was replaced by the Skyride, with a new station being located at the end of Towers Street freeing up space for the Tea Cups ride to be to be installed. The iconic Swan Boats also made their début in the Ingestre Lake. With the Tussauds Group's takeover of the park a program of development was formulated and Aqualand was split to with part of the area becoming Katanga Canyon and Thunder Valley. The heart of Aqualand was temporarily incorporated into Towers Street before being given a medieval theme and becoming Merrie England. In 2008, Merlin Entertainments first big addition to the park saw Merrie England transformed into Mutiny Bay with a pirate overlay to most existing attractions and the addition of Battle Galleons, Heave Ho and The Pirates of Mutiny Bay show to complete the area's line-up. March 2009 saw Sharkbait Reef open in the area, inviting guests to venture under the sea and admire the beauty of the oceans. The pirate theme was continued through the attraction to ensure it blended in seamlessly with the rest of Mutiny Bay. 2016 saw big changes for Mutiny Bay. The Flume, Mexican Cantina and Ben and Jerry's Scoop Shop all disappeared behind construction walls ready to make way for the park's next big attraction, then codenamed SW8. The season also saw the Pirates of Mutiny Bay Show go into hiatus, with the nearby Courtyard BBQ and Treasure Trove shop shuttered for the season as well. By 2018 the addition of Wicker Man had seen the Beornen move in to claim the old Flume site and the neighbouring buildings as their territory.